Malarplasty is the medical term used to describe the augmentation or general reshaping of the cheeks and jaw. Cheek and chin implants were first used for reconstruction of the face after birth defects and damage caused by accidents or trauma. Now, cheek and chin implants are used regularly by cosmetic surgeons to make a person’s cheeks or jaw line of a more pleasing shape. Various types of materials are used in implants, ranging from silicone to your own body fat. The operation takes between 30 minutes to 2 hours depending on the extent of the procedure and the implant material used. Considerable swelling, some pain and difficulty talking and smiling for several days following the surgery is normal after chin and cheek implants. You can expect to return to work after 2 days to 1 week. Private prices for facial cheek or chin implants can be in the £1,500 - £3,000 range depending upon the type of implant used. Cheek and chin implants were first used for reconstruction of the face after birth defects and damage caused by accidents or trauma. Originally, solid silicone implants were being used in the late 1950’s for re-building the face in this way. Now, in the early 21st century, cheek and chin implants are used regularly by cosmetic surgeons to make a person’s cheeks or jaw lines more rounded and of a pleasing shape and to correct any defects that may have occurred. Malarplasty is the medical term used to describe the augmentation or general reshaping of the cheeks and jaw. Patients with a major chin deficiency may require a more serious type of procedure, requiring bone surgery to move the bone of the chin forward to reshape the chin. Chin reductions can also be performed by surgeons to reduce the bone to make the chin less prominent. Certain types of facial implants can be used to reduce the appearance of lines and wrinkles, particularly around the nasolabial area (between the corners of the nose and the lips). According to statistics from the American Society for Aesthetic Plastic Surgery (ASAPS) there were just over 1,700 cheek implants in 2009, a decrease of 18% over 2008 figures, and 5 963 chin augmentation procedures performed in the U.S. in 2017, an decrease of 10.7% on 2012 statistics. (Note: due to an insufficient sample of physicians performing cheek implants figures on the procedure were excluded from the 2017 results). There are no similar detailed statistics available for the United Kingdom yet, but we do know that this kind of cosmetic surgery is still available in the UK. 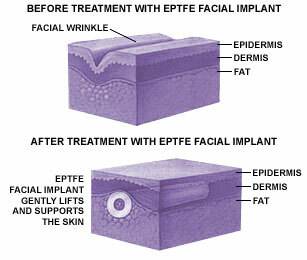 If you are considering a facial implant the following information will give you a basic understanding of the procedure. It can't answer all your questions, since a lot depends on the individual patient and the surgeon. Please ask a surgeon about anything you don't understand. What are the different types of Facial Implant used? Originally bone grafts (bone taken from another part of the body to be used in the face) were used to help reshape the chin. The obvious disadvantage of this is the process of first having to collect a piece of bone from a donor site in the patient’s body. The first synthetic (or man-made) implants that avoided this problem were designed in the 1950s and were made of solid silicone. These implants are safe, long lasting, and are still a popular choice used by many surgeons today. Rigid polyethylene implants are an alternative to silicone and can be screwed into place into the bones of the face to prevent them moving after the operation. Another common implant material used in the U.K. is a synthetic material called ePTFE (expanded polytetrafluoroethylene). It is a white "rubbery" material - the same thing used in Gore-Tex™ boots and rain jackets - but of course it is totally sterile and made specifically for medical use only. Development of this material into different shapes has allowed it to be used as a facial implant for chin and cheek augmentation, lines and wrinkles in the face, and lip enhancement. Your own body tissues can grow around these implants and help to keep them in place. Hydroxyapatite Implants: medical science has come up with a way to alter coral into an implant material that closely resembles natural bone. It is called hydroxyapatite or simply, H.A. It has both the sponge-like structure and chemical make-up of bone so that the body accepts it completely. The body’s tissue can be integrated naturally and it will not cause the hardness that is sometimes the problem with silicone implants. H.A. is the closest thing to a natural bone graft that scientists have yet invented. Another different approach used by some doctors is the use of human tissue. Some surgeons will use small strips of your own tissue (cut from areas such as the groin) and, after careful preparation, implant these strips into your face. This is known as an autograft and has the benefits of being your own natural material, which will not be rejected by your body. In practice, this procedure is now little used owing to the fact that you will have scars at the point from which the tissue is taken and your donor tissue is difficult to prepare in order to achieve a successful graft. Alloderm® is another alternative. This uses donated human skin that has been especially prepared by removing the outer layer of skin and freeze drying the layer underneath the surface. Using someone else’s tissue rather than your own is known as an allograft. Careful screening of the material for viruses is undertaken, and the material is specially prepared so that there is little chance of your body reacting to it or rejecting it. A skin test is not required before the insertion of this implant. Over time, this biological implant grows into the patient's own natural soft tissue, but it may not last as long as other forms of implant. Your own fat may also be suggested as an implant material. This can be collected from different parts of your body using liposuction and then injected into different parts of your body. Please see our fat transfer section for more details. Certain dermal fillers may also be suggested as an alternative to the implant materials described above. These are particularly used for lines and wrinkles or “plumping out” the cheeks. What happens during a Facial Implant operation? In your first discussion with a practitioner, you should explain what you expect from the treatment and how you would like to look afterwards. He or she should tell you exactly what the treatment will involve, and discuss any potential complications and the recovery process following any procedure. He should make it clear that he can achieve the results that you desire. You will need to discuss the advantages and disadvantages of the different types of malarplasty surgery and implant material used. If you choose a synthetic implant, you would normally require a skin test before surgery to ensure that you are not allergic to the material. A medical history should be taken by the practitioner to make sure that there are no reasons why you shouldn’t have a facial implant. Once this is established, you would normally be asked to read detailed information and sign a consent form, which means that you have understood the potential benefits and risks associated with the procedure. Local anaesthetic injections along with a mild sedative to make you feel drowsy may be used. Alternatively, a full general anaesthetic may be used, depending upon the area treated and implant material used. As with any surgical procedure, the use of a general anaesthetic carries a small additional risk which your practitioner will discuss with you. No form of anaesthetic will be given to you without your surgeon discussing it with you first. The procedure is usually performed in an outpatient surgical centre, either run separately by your surgeon, or in a hospital. The operation takes between 30 minutes to 2 hours depending on the extent of the procedure and the implant material used. This involves placing the implant over the cheekbone through a cut made inside the mouth or through an opening just beneath the lower eyelash. The incision blends with the lash line and is nearly unnoticeable. The surgeon creates a pocket in the tissue and then places the implant in there. Malar implants are inserted in the outer upper cheek area giving that high cheekbone look of many models. Submalar implants are inserted in the lower or mid-cheek region to help fill out a sunken face. The face seems to become thinner as we age and many people seek this kind of implant to return their faces to a more youthful look. In fact, a more natural appearance can be achieved with fat transfer because this recreates the “rounder” look to your face by using your own fat from somewhere else in your body. Some patients choose to have a combination of both malar and submalar implants to plump out both the cheekbones and main cheek areas. In some cases, depending on the type of implant material used, a small titanium screw may be used to attach the implant to the bone. Incisions used are closed with stitches that dissolve in a week or two. Incisions are usually made inside the mouth on either side of the lower lip. However, depending on the structure of your face, some surgeons may use an incision point directly under the chin which will leave a small scar. 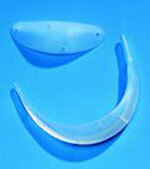 The surgeon creates a pocket into which the lower-jaw implant can be placed. Cuts under the skin are closed with dissolving stitches, and incisions on the outside of the skin are usually stitched with removable stitches. This procedure is usually done using a local, rather than a general, anaesthetic and takes around 30 minutes or so. The most common area of use is for nasolabial folds (the lines between the corners of the nose and the mouth). Small incisions are usually placed either side of the line, and the implant material is threaded through the skin beneath the fold to help to plump out the line. The tiny incisions are then stitched together. No repeat procedure is required for synthetic implants as their effect is permanent, but if you choose to use a non-permanent implant material, you may need to return occasionally to have another implant put in. How long will it take to recover from a Facial Implant operation? Depending on the procedure and the extent of the bruising and swelling, you can expect to return to work after 2 days to 1 week. What are the risks and potential complications from Facial Implant surgery? There will be some considerable swelling associated with the disturbance to the tissues, especially if there were screws involved in fixing the implants. Some pain and difficulty talking and smiling for several days following the surgery is normal after chin and cheek implants. Most of the swelling and bruising will have improved within a week, but longer lasting mild swelling after both chin and cheek implants may prevent the final, new shape of your face not being apparent for several months. You may feel a degree of numbness that should disappear within 1 - 3 months. As with most medical procedures, there is always a possibility of risks or side effects following malarplasty facial implant surgery. These include infection, a reaction to the anaesthesia, haematoma (a mass of clotted blood), or seroma (a collection of the watery component of the blood which gathers underneath the skin). Both haematoma and seroma may need to be removed with a syringe. Asymmetry, or a lop-sided look to the face following implants, and nerve damage, can also be potential complications. Depending on the type of implant material used, capsular contracture can occur. This is a condition in which the scar tissue after the operation becomes very tight, thus causing the implant to become distorted. However, this is a very rare complication. Sometimes, a facial implant can shift slightly out of its proper place and a second operation may be necessary to replace it in its proper position. Tiny scars from any external cuts to the skin are visible, although they usually become unnoticeable over time and can be camouflaged with make-up. What should you do after a Facial Implant operation? It is very important that you follow the advice of your practitioner carefully after a facial implant to help to improve the benefit of the procedure and reduce the risk of complications or side effects. Who should not have a Facial Implant operation? First and foremost, an individual must be in good health, not have any active diseases or existing medical conditions and must have realistic expectations of the outcome of the surgery. For chin and cheek implants, any problems with bone disorders may make you unsuitable for this type of procedure. You should not have been on isotretinoin for the last 6 months or sometimes more. This drug causes excessive facial bone growth, called Hyperostosis, and increased scarring after skin disturbance such as is caused by an implant operation. If you are prone to keloid (red, angry, raised) scars, or have a history of problems with wound healing your practitioner may not recommend this procedure or may caution you that scars could be raised and very visible. Who can perform Facial Implant surgery? Only fully trained and qualified surgeons should perform cheek or chin malarplasty surgery. Is Facial Implant surgery available on the NHS? It is highly unlikely that anyone considering a malarplasty facial implant for purely cosmetic (rather than reconstructive) reasons would be able to access this free of charge on the National Health Service. What is the average cost of Facial Implant surgery? Private prices for facial cheek or chin implants can be in the £1,500 - £3,000 range depending upon the area of surgery and type of implant used. Permanent cheek or chin implants skilfully placed can produce subtle but very definite cosmetic improvements to your face that can last a lifetime. Similarly implants used for deep folds or wrinkles can provide an instant improvement in their appearance that can be long lasting. Some people believe that they have received too much implant material and demand that their implants be removed; however patients must bear in mind that there is significant swelling immediately following this procedure and that mild swelling may persist for several months afterwards. Thus, you have to be patient after an implant operation as it can be months before you see what your “new face” really looks like. Careful discussion of your expectations, the appropriate type of implant, and choice of a skilled malarplasty surgeon, are all very important factors for you to consider before going ahead with a facial implant. Cheek Augmentation before and after pictures courtesy of Consultant Plastic Surgeon, Mr Christopher Inglefield, BSc, MBBS, FRCS (Plast) at London Bridge Plastic Surgery. Click for ALL Facial Implants (Cheek and Chin) clinics in the UK & Ireland registered and verified by Consulting Room.